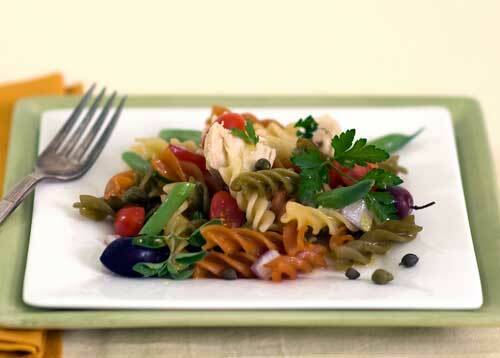 Combine green beans, olives, onion, parsley, capers and tomatoes in a large bowl. Combine garlic, olive oil, vinegar, mustard and oregano in a small jar and shake well. Pour dressing over vegetables and toss well. Let marinate in refrigerator for 1 hour. Cook rotini according to package directions. Rinse and drain well. Toss warm pasta with tuna and marinated vegetables. Serve immediately.